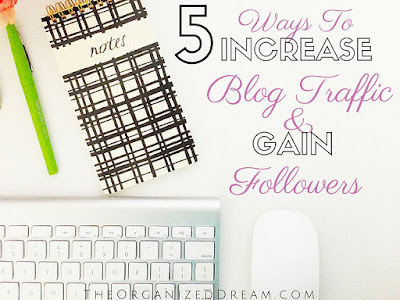 For us bloggers, it's hard to figure out at first how to really get our stuff out there and to gain a true following. 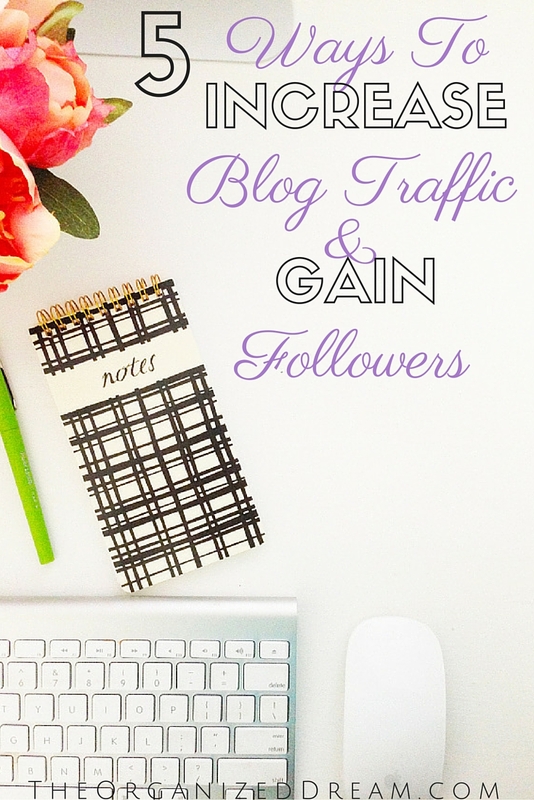 I've been blogging now for almost two years and I've tried different ways to gain traffic and followers. These are my top five methods. Scheduling ahead of time is a great way to make sure your content is getting out there for people to see without you investing every minute. I've used many different social media schedulers, but out of all of them, I like Buffer the most. They have an easy to use site that allows you to schedule all of your major social media accounts. They allow you to add photos to your posts and even send you a weekly analytics email to allow you to see which pins, tweets and posts were more popular so you can find the best time to post. Being on your actual social media account is key as well. You need to make sure that you are responding to your followers when they message you or comment on one of your posts. It makes them feel heard. Joining, starting and carrying on conversation will create a buzz about your blog and people will stick around. There are many benefits of a link party. If you are not sure what a link party is or how to join one, visit my How To Link Up: Joining A Link Party post. You'll find all of the information you'll need. Not sure of where to look for link parties? Visit my Ultimate Link Party List for many listed by day. The best way to increase your page views from link parties is to make sure that you use an eye-catching image in your linkup. There are usually a lot of links in a party and using a bold image that not only tells the story of your blog post, but also catches the eye will bring in a lot more visitors. I typically use images that do not have words on them such at the title image. Do you host a link party? When hosting a link party, visit the people that link up and leave comments on their posts. Invite them back and thank them for joining. Chances are, they will. Don't forget to leave your website and name when you visit so they know where to go. You can also do this when you visit posts from other parties. I've seen it many times where other blog party hosts will leave URL links to their parties on posts they find interesting. Don't forget to leave a honest and kind message with your link or you'll come across spammy! When it comes to trying to get subscribers for a newsletter or visitors in general, try giving something away. By providing a free service or even a printable will get people to stop by and engage. For instance, you probably noticed when visiting this post that there was a drop down message that asked you if you would like to subscribe to my newsletter and receive my Free 2016 Planner, Calendar and Organizer in return. I've built a large number of subscribers from this. Offering a prize is another way to gain followers and new visitors. It could be anything from a gift card to the hottest toy everyone wants to get their hands on. Filling out a Rafflecopter form and putting it in your post will allow people to follow you on a variety of different platforms in exchange for an entry. You can make as few or as many as you'd like. I've gained many followers with roundup posts. One of my most popular posts like this include 25 Copy Cat Recipes From Your Favorite Restaurants. I've received thousands of new visitors from this because people like the ability to find what they are looking for in one place. I like to write about what could possibly help people. I especially like to share what I have learned. One of my more popular posts on the matter is my How To Create Printables post. It doesn't have to pertain to blogging though. It could be something like crocheting or building a shelf from a pallet. Providing information will always keep people coming back and will work well with search engines when people search for what they need. There is no point to blogging when you're not talking to other people. Visit other posts and start conversations. This is something similar to when you are joining link parties. Share personal stories or instances on posts you find interests in. Share information with fellow bloggers. Don't forget social media. Sharing a project you like of a fellow blogger or even giving a shout out can go a long way, too. Sending a little traffic to others means that they are more likely to do the same for you. This also goes for the bigger bloggers. It may be a little hard to get in touch with them because, after all, a bigger blog means more people to keep in touch with, but becoming blogging pals with the big cats can help you in the long run. You can do this by trying to guest post on their blogs and allowing them to do the same or to apply to contribute to their blog. I hope that this will help you in one way or another or at least inspired you in some way. They may not work for all of you, but I wanted to share what has worked for me so far! Thanks for stopping by! 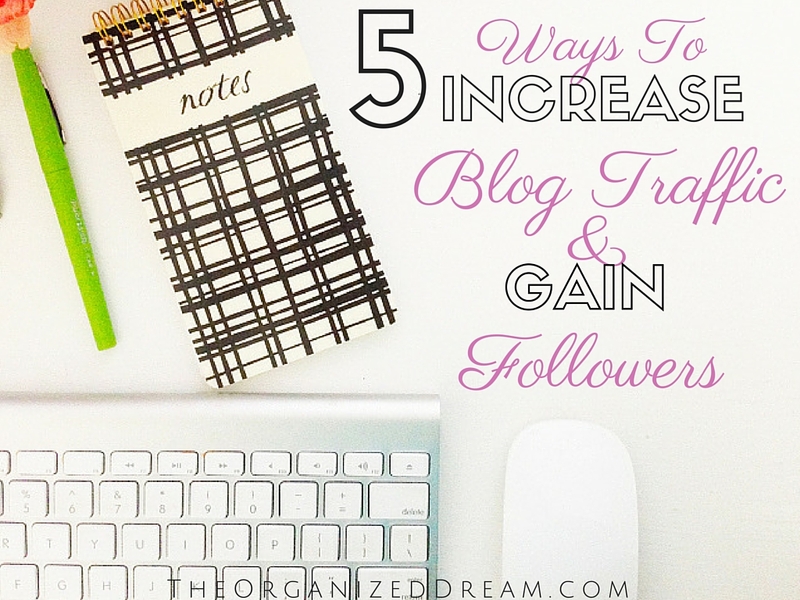 Great tips, I'm in the process of trying to increase my traffic and these will definitely help. I also linked up to your party, thanks for hosting! I agree with Carmen, Great tips! These are great tips. I have been working on implementing them on my blog, and traffic is slowly increasing. Slow and steady wins the race, right? Thanks for the suggestions. All great, but so time consuming and I am having a hard time with that as I do not have a lot of time. I frequently have to choose between linky parties and promoting or writing a new post as there is not enough time to do both in a day. It is time consuming! I had a really hard time with it at first, but I am a full time (at the moment) mom on the go and have been able to do these fairly well. I wish you the best of luck! Great tips, lady! I find that link parties are the best way to find new blogs and find new friends. These are some great tips. Some I'm already using and some I need to begin. I was receiving great feedback and getting a lot of views and this past month was horrible. I still got visitors, but about half of what I'm used to. It actually hurt to see the numbers go so low. I'll be working on things in the next couple of months to bring back my followers. I've had my bad months also, but it happens depending on what kind of niche you're in. Link parties are such a fun way to discover new blogs! I really like them for that aspect. I adore Hootsuite for scheduling my Twitter posts. I'm still on Twitter constantly (because you have to BE ON social media if you're going to *be on* it!) but it's nice to have things scheduled out in advance so that I can spend more time interacting with people than posting things in real time. Scheduling is definitely the way to go. In the beginning, I would be on the computer every chance I could to post updates. I can't understand why it took me a while to discover the magic of schedulers! Great tips!! I don't use all of them, but some have definitely worked for me. Linky parties is a big for traffic. With Pinterest I have found that joining collaborative boards has been the greatest source for success there. Great tips! I haven't done any giveaways. I'm worried that I will attract the wrong following with those, and maybe lose some regular readers. I did do one giveaway since starting my blog. I understand where you're coming from. It's hard to build a true fan base when you're pretty much asking for them, but some of my followers stayed. You can never have too many tips like these, thank you so much. You're welcome, Sandra! Thanks for stopping by! Great ideas! I especially like the round-up idea. And I'm headed to your printables post right now! :) Stopping by from #LFEO! Thanks for your tips. I haven't done a give a way in quite awhile. Maybe it's time again. I love all of these! I've especially found networking to be helpful in meeting other bloggers who are willing to help each other. Thank you for the invite! I'm heading over now! Great advice, I have employed many of these strategies and found them to be very helpful. Thank you! This was really helpful! Great post :) I might have to put a few of these into practice in the near future. Very practical advice. Unfortunately so much of it is very time consuming! I find it hard to do linky parties and network as much as I would like without sacrificing my minimal sleep for it. It is time consuming, but I find that if I link up in the morning and go back to check out other people's work, it makes it a whole lot easier. I try to visit at least 2 per party. Great post! I've been working on increasing my traffic really hardy lately. I've been joining at least 2 link parties a day, seems like I spend all day commenting and no time to work on my post. I was using Buffer regularly then kind of slacked off, then just starting scheduling on it again today a little earlier. I have done a few giveaways as well but haven't had a very big turnout with them. But I will keep trying. That for sharing your traffic tips! Pinning! Awesome post! These are some really helpful tips. I need to work on several of these. I need to give Buffer a try. It seems like the social media aspect of blogging takes up more time than creating content! Scheduling out those sorts of things would make life so much easier. Great tips! I'm happy to say I do almost all of these. I should create a printable though. I also need to figure out my newsletter. As of right now, I'm completely blind. Visiting from Thriving On Thursday. Thanks so much. I am trying to increase my blog traffic too. I have my first giveaway next month. Great tips! I enjoy using Buffer, too. Great tips Kate. I want you to know that I really appreciate your visiting us and leaving thoughtful comments on our posts. There are some party hosts that don't do that and it makes us feel as if it is a one way street. Especially knowing that there are many out there who link and run. It can be hard to want to continue with some of the big link partys. Thanks again for your thoughtfulness. Would LOVE for you to stop by Coffee & Conversation on Wednesdays...and add your party to our own Directory - "Where We Party!" Thanks for the tips! I hadn't heard of the scheduling app Buffer, but will check that out. Thanks or linking up to This Is How We Roll linky party! Great Tips!! Thanks for sharing on My 2 Favorite Things on Thursday!! Hope to see you again this week!! Pinned! These are all great tips! I'm all for them and have tried them myself with great success!! Thanks for the putting the list together. I love visiting the blogs on my linky party each week. I enjoyed your post and am interested in checking out your recommended scheduler program. Thank you for sharing it with us at the Brag About It link party! These are all such great tips and I couldn't agree with you more about each one of these! Thanks so much for sharing at Share The Wealth Sunday!!! Thanks for sharing at the party. Pinned & shared. Your linky party list link didn't work for me. I was going to check it out. Hope to see you again soon at the Inspiration Spotlight party. These are all very useful tips and ones that any blogger could benefit from. Thanks for sharing at Snickerdoodle Sunday. Pinned and Tweeted and I'll be featuring this at today's party. "Roundup and informative post"; I hadn't thought of doing this one yet. What a great idea! Thanks for the great blogging tips you share here on your blog. Hi Kate Lynn, thank you for this informative post! Is sure takes a lot of time to do all of these things, but they pay off. These are great tips and I am going to plan on implementing them. I always love finding ideas to help increase trafffic. Thanks! Thanks for the tips! I've heard of BoardBooster but not Buffer so I'll have to check that one out.